The tiny dolls came as a toy inside of a Kinder Surprise chocolate egg. The eggs are made by Italian company Ferrero, but are not sold in the USA due to a 1938 law against embedding toys in candy. 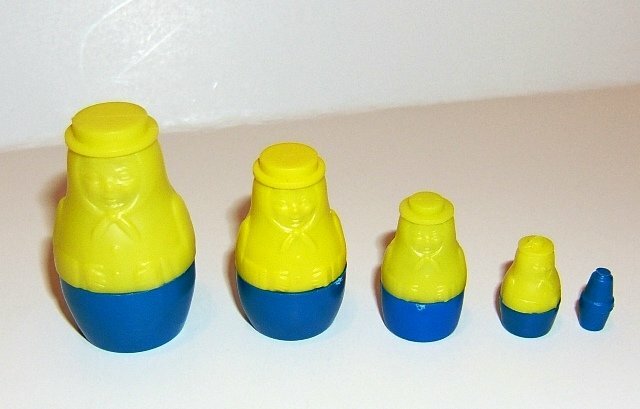 This small plastic doll is made of yellow and blue plastic and is a little over 1.5” tall. The little dolls have a chubby 3-D face and arms, buttons, and a scarf tied under the chin. They wear flat hats. In addition to nesting, they also stack – each doll snaps onto the top of the larger doll’s hat.